Red Line train at Davis Square standing by because of switching problems at Alewife Station. Happens to us a lot here. Sigh. Love the colorful artwork on the wall! Wish our stations would put some up. What a mess! It took so much time for my 2 sons to come back home! 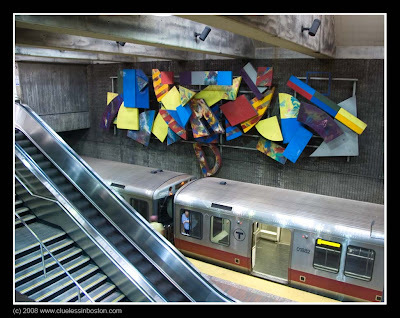 Is the artwork located in Alewife station??? Hilda, thanks for stopping by, not all train stations have such colorful artwork, this is one of the better stations. Dorothée this is at Davis Sq. Station. Thanks for visiting and reminding me I need to brush up on my french. Was the switching problem perhaps caused by Davis's Square wife having too much ale? Great photo. Love the colors.